Our modern farmhouse kitchen design took quite a bit of planning but I am so excited to say that the plans are finally complete. 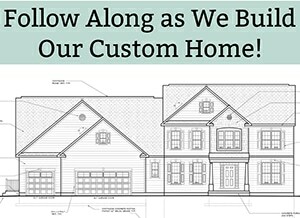 If you haven’t been following our story, check out our custom home building story here. 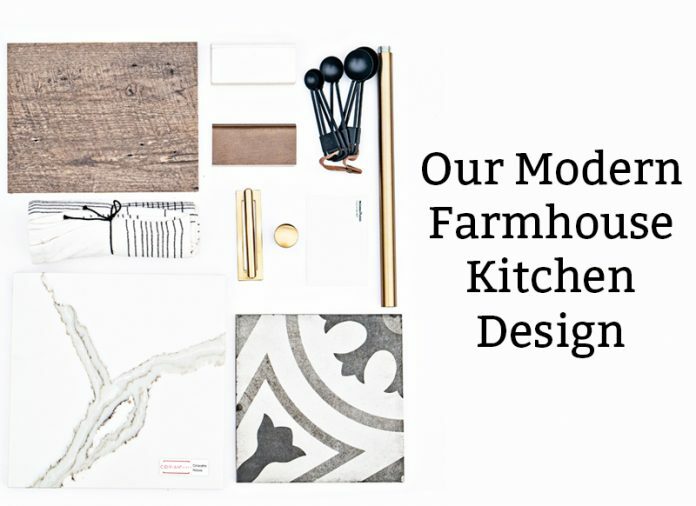 When designing the kitchen, I wanted to strike a balance between the farmhouse style and a more modern, industrial style. 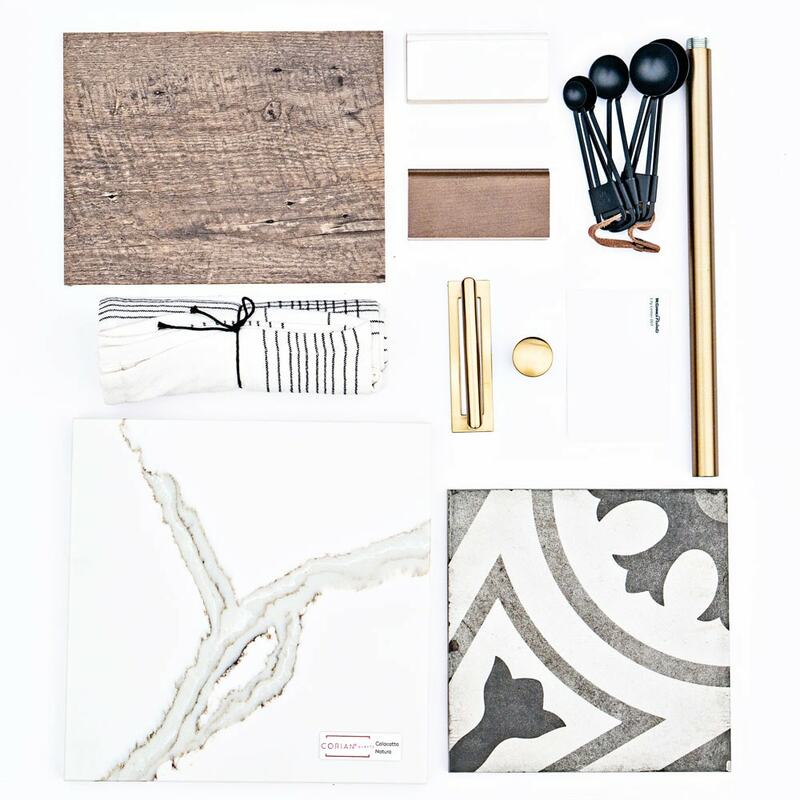 There are so many different styles I love and I don’t necessarily stick to one style in my home, I just select things that I love and hope that they work well enough together. Now, this design wasn’t just done by me. While I had a vision, I needed an actual kitchen design. And that’s where my amazing kitchen designer, Robyn Levy from Kitchen & Bath Creations, comes in. (More on them at the end of this post). 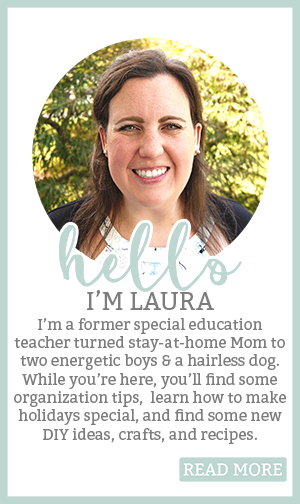 She was the person we worked with to design our kitchen, plus, she’s been a sounding board for all things home design. She understood my style and me immediately. And thankfully, she is super patient which is needed when working with me since I change my mind (a lot). Our kitchen includes a whole lot of cabinets and a gigantic 9-foot island with a morning room off the main workspace. The morning room will act as our dining room. 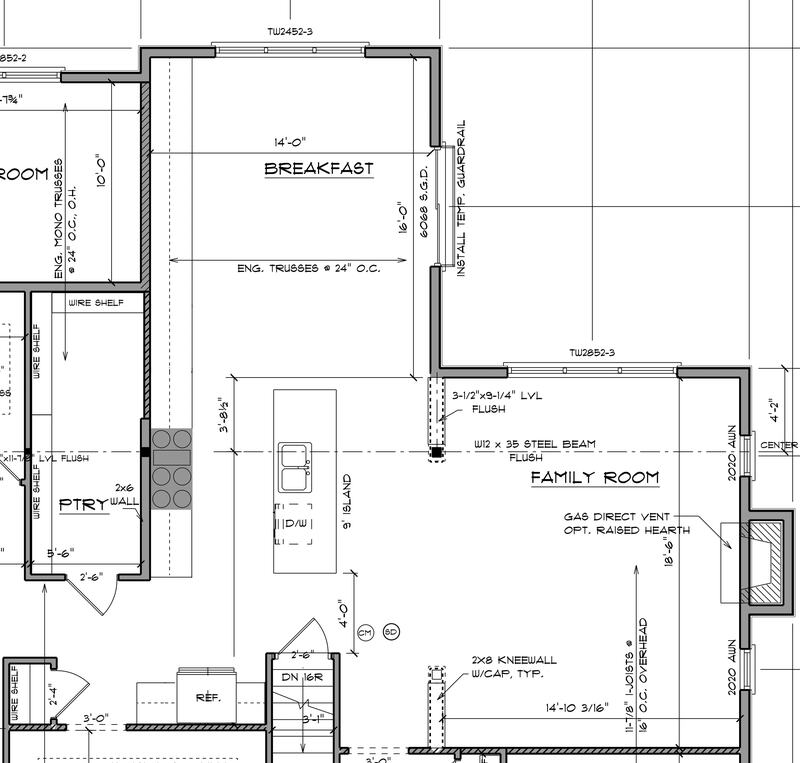 The dining room in our house plan was turned into a playroom (click to see our house plans). 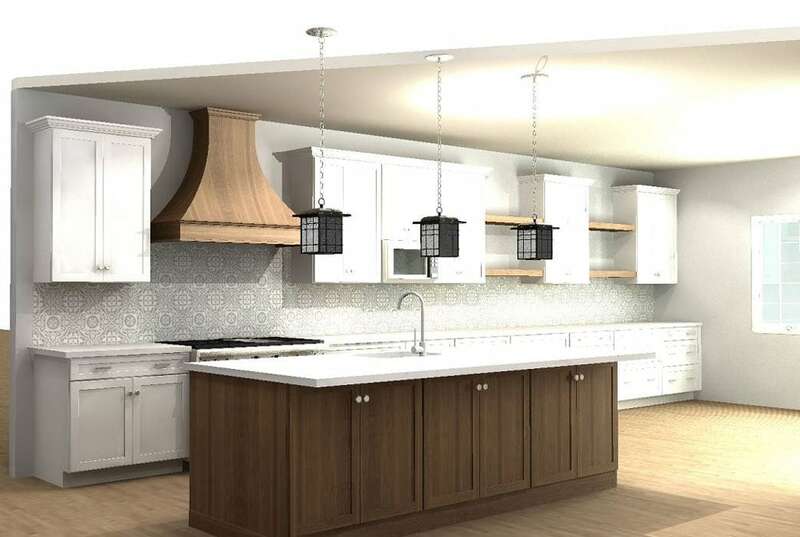 The kitchen cabinets will be white along the perimeter with stained island cabinets, shelves, and range hood. 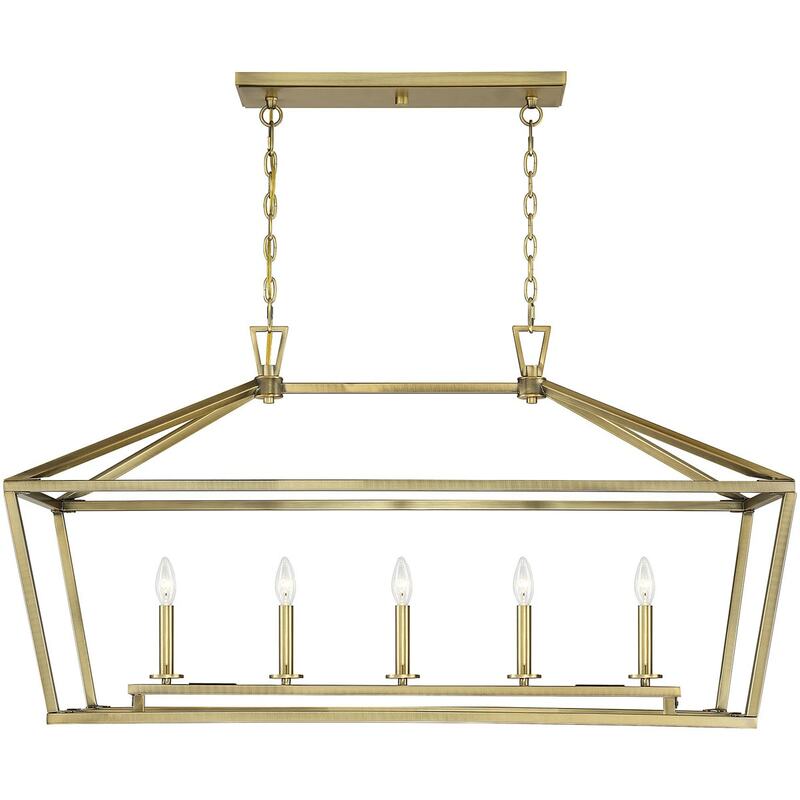 The hardware will be a honey bronze which is like a light brass color. So not your 80’s brass, a little variation of it. For now, we’ll be sticking with our current dining room table from Pottery Barn (although it needs to be refinished after a Christmas mishap where I scratched the heck out of my beautiful table). Bar stools still haven’t been selected. What type of bar stool do you think would look good? Let me know in the comments below. Here is our kitchen layout from above. The island and stove placement are not exact. This also includes the family room in the floorplan. This blueprint is from Castle Rock Builders. 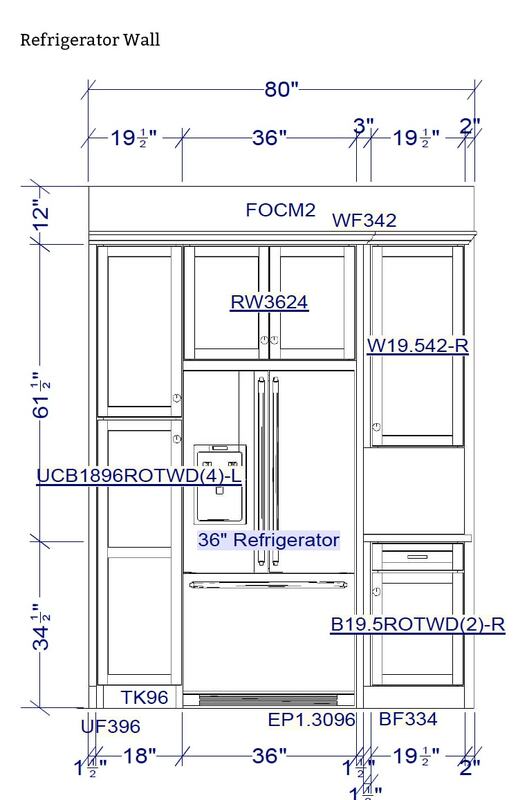 Next, are 3-D renderings of the cabinet design. These are not the lights, backsplash, hardware, floor, etc. that we will be using. The cabinet colors and design are correct though. 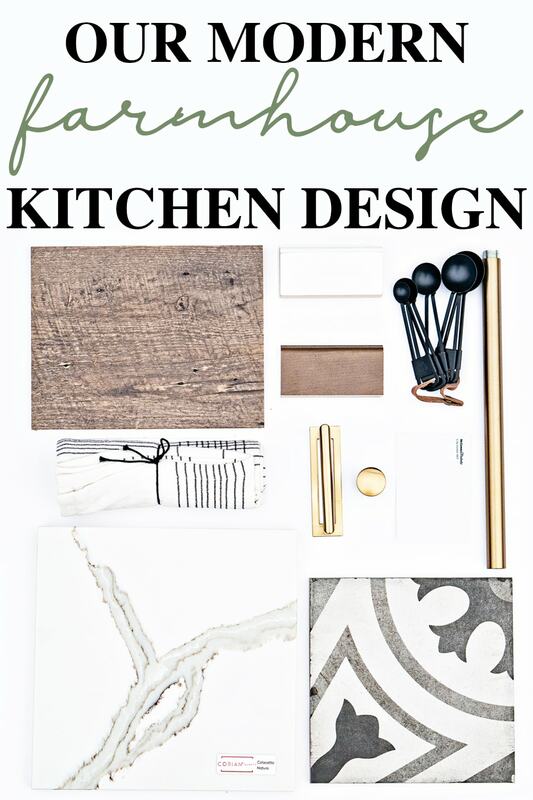 These kitchen designs are from Robyn Levy at Kitchen & Bath Creations. 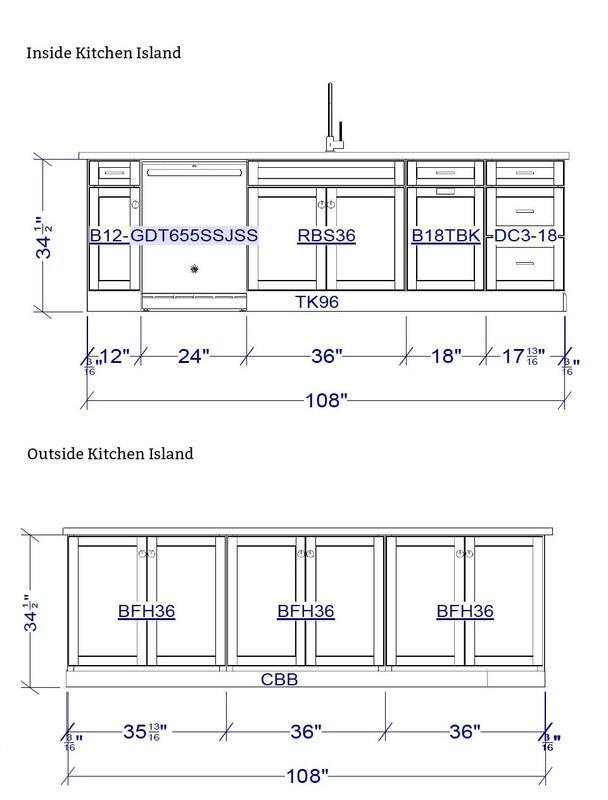 Finally, these are the drawings of the kitchen cabinet layout. I added some of the kitchen details in the first picture. For the remainder, the title above the picture tells you what you’re looking at in the picture. As an Amazon Associate, I earn from qualifying purchases. 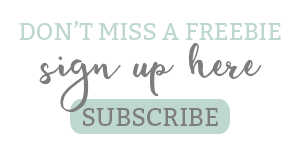 As an affiliate for ShareASale (which includes Joss & Main and Wayfair), I earn from qualifying purchases. Learn more here. Recessed Lighting – we have 6 recessed lights within our main working space in the kitchen. We opted not to put any in the breakfast room area so that it would feel more intimate and not as bright. 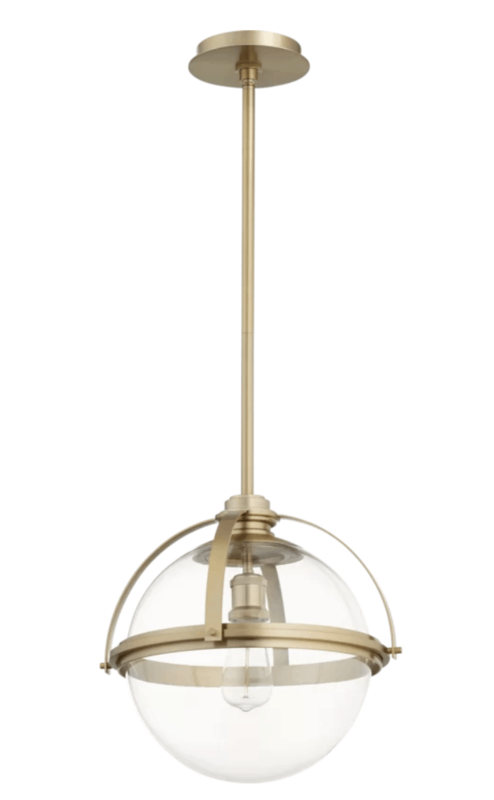 Island Lights x 2: Doucet Meridian 1-Light Globe Pendant from Joss & Main in aged brass (20-inch size pendant). You can see how large it is here on my sneak peek on Instagram. If I am being honest, while I love the backsplash now, it’s not exactly what I had in mind when we were designing the kitchen. 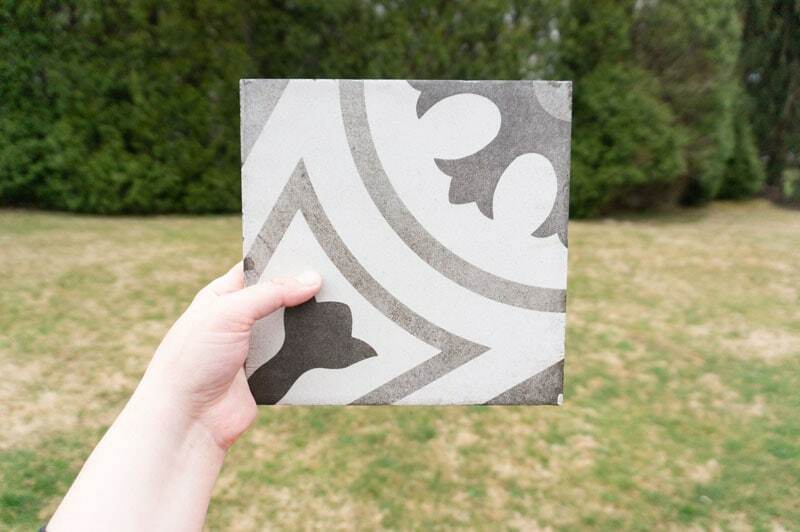 I had my heart set on encaustic tile but thought it would be out of our budget. 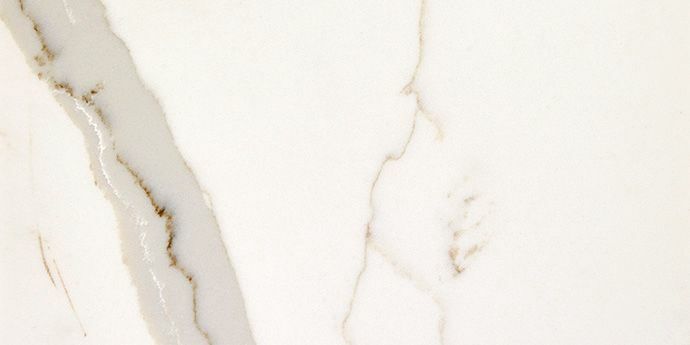 Our kitchen designer told us that we should still check because labor is cheaper than subway tile so it may be the cheaper option – and she was right! and once we learned it was cheaper than subway, I was ecstatic. 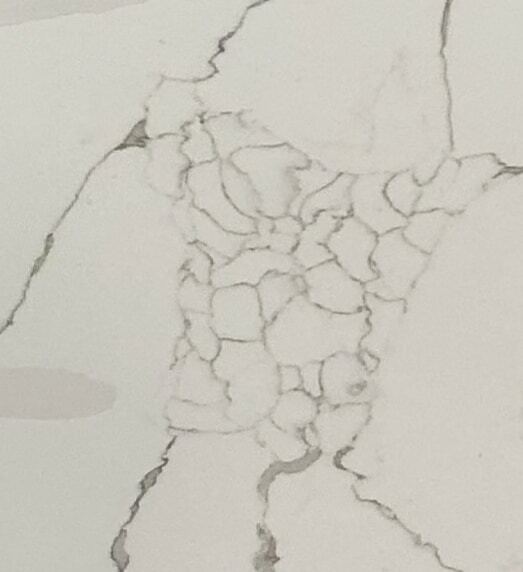 The tile has a creamy gray background. I was hoping for something that was more white to match the cabinets and counters a little better. But, the flooring company and our builders couldn’t get us anything else (their selections are limited and a bit outdated). Why didn’t we just do a backsplash aftermarket ourselves? Because that would mean moving our very expensive, very heavy, stove out of place. That could mean damaging the floors, oven, counters, cabinets, etc. The risk just wasn’t worth it to us. We chose to go with a luxury plank vinyl product after we had a horrible experience with real hardwood floors (you read why it was our biggest remodeling mistake). This flooring is 100% waterproof and it’s scratch proof. It’s perfect for children and pets. Plus, even though it’s fake, it looks like real hardwood. Our flooring supplier didn’t have the best selection (honestly, their products overall were pretty limited and out of date). This is one of the times I became a not-so-much-fun client. I refused to accept any of the floorings that they had available for us. 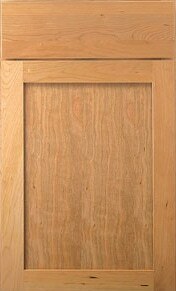 After some back and forth, the company was able to source another floor from Armstrong. 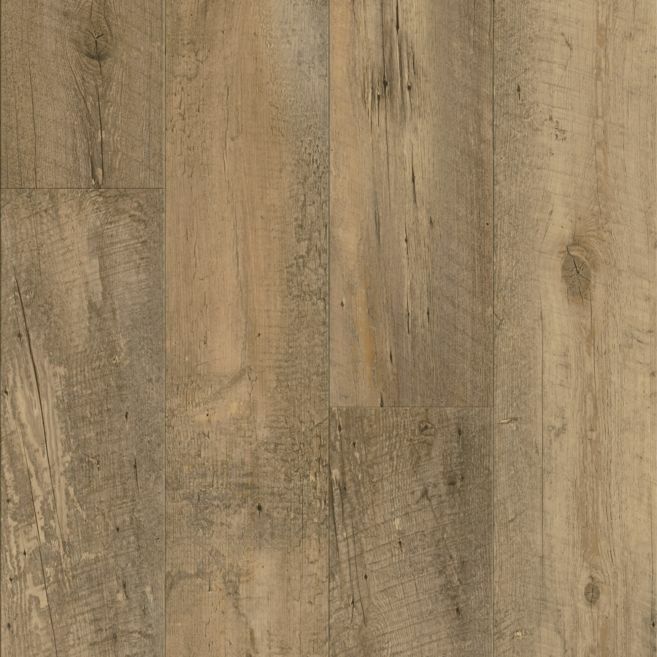 I had to pick the floor I liked the best online and cross my fingers we would like it in person. Thankfully, I loved the sample when it arrived. Contrary to what you’d think (well at least what we thought), our luxury vinyl flooring cost more than the hardwoods that came standard from our builder. We were shocked but after our experience with hardwoods, we decided to pay the upgrade cost. The counters are my favorite selection in the kitchen because they tie the entire room together. It’s hard to tell in pictures, but there is a gold vein within the counters which brings out the brass hardware and lights. When selecting counters, I used Photoshop and sample images online to try out over 50 different counters (you all know I love my options). I was able to narrow it down to about 5 choices. The estimates came back and the upgrade costs were $4,500 vs. $6,800. Our builder only provides level one granite so it was a big upgrade. In the end, we decided that it wasn’t worth picking something I would be unhappy with (kitchen counters are pretty important to a kitchen design, especially when you have so much counter). 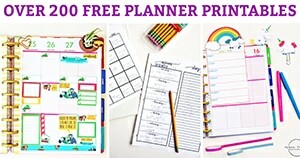 Oh my goodness, I am totally in love with this range. 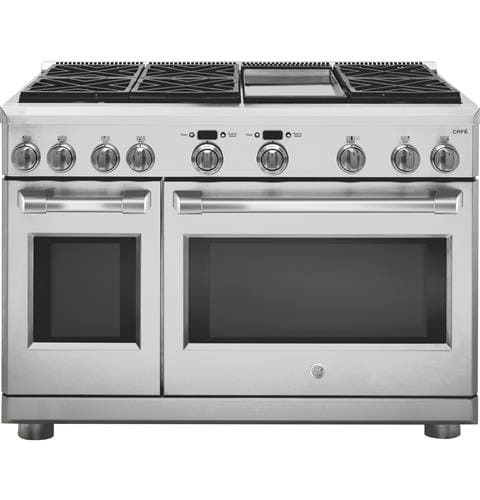 We had planned to do two wall ovens (it had always been a dream for me) and then when I went to a local store to try them out, I had trouble accessing both ovens due to my height. So, I looked around the place and saw a large 48 inch Wolf range. I knew that a Wolf would be way out of our budget but the idea of a large range was exciting to me. Our builder sourced some similar ranges and we decided on the GE Cafe one. 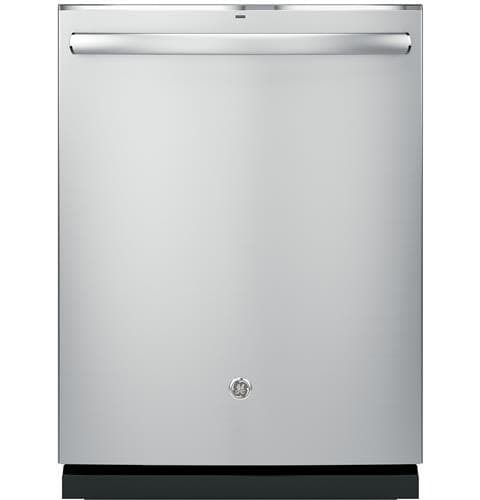 This is the dishwasher that comes standard from our builder. We didn’t need or want anything fancy. Refrigerator – we will select this aftermarket. I will update the post once we have selected our fridge. We can’t order it until we get closer to the completion of the house (we are going to wait until Memorial day weekend sales). 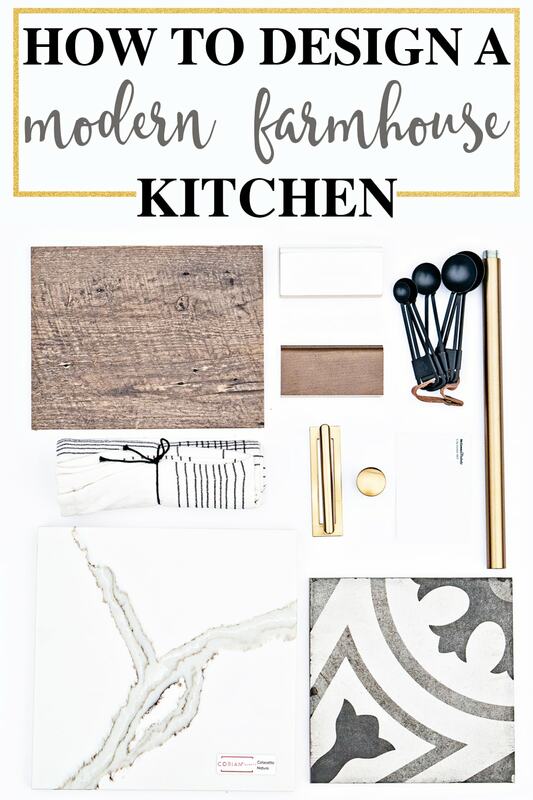 Are you in the Baltimore-Washington area and Looking to do a Kitchen? KBC serves the Baltimore-Washington Corridor and neighboring areas. 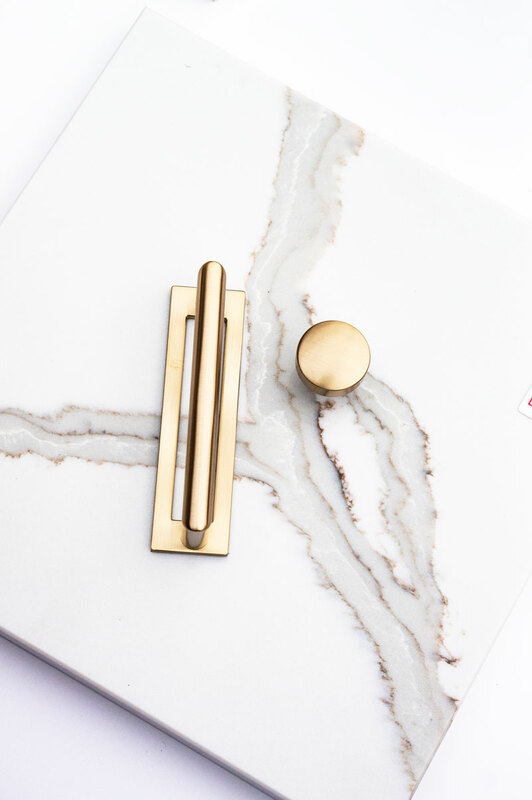 In addition to being Maryland’s Cabinet Expert, they have done kitchen and bath installation projects in Central Pennsylvania, Delaware, West Virginia, and Northern Virginia as well. So if you’re in the area and in need of a new kitchen or bathroom – you won’t regret choosing them. 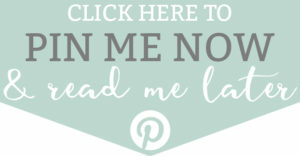 I don’t get anything for recommending them – I just highly recommend them.